Specialists in the manufacture and turnkey installation of dairy and cheese production lines since 1919. Few companies can boast a century of experience. 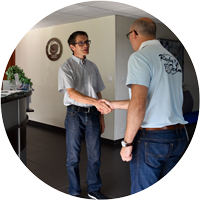 CHALON MEGARD is historically the most important supplier of equipment for cheese and dairy factories in France, and one of the most present in Europe and in the world. By equipping almost all PDO cheese producers, CHALON MEGARD demonstrates its ability to listen to its customers, making it possible to develop equipment that really facilitates the daily work of cheese makers, meet the requirements of standards, improve hygiene and productivity, reduce waste, while maintaining the quality of the products manufactured. CHALON MEGARD is innovation in the respect of tradition. 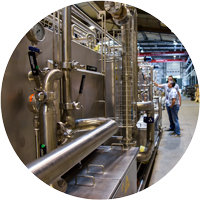 Synext Group brings together leading companies in their markets that design, manufacture and commission turnkey equipment and solutions in cheese and dairy sectors. The group relies on collective expertise to consolidate its regional and global leadership. 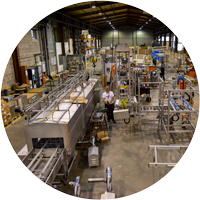 The CHALON MEGARD experience allows us to design complete production lines in perfect accordance with your current needs and your future objectives. We can develop flexible lines to increase your productivity in terms of throughput and volume. The adaptability of our lines can also take into account the evolution of your product range with production versatility. CHALON MEGARD is committed to respecting the environment. This is why our CHALON MEGARD cheese production lines ensure a reduction in your energy consumption including a reduction in your water consumption thanks in particular to an optimization of CIP washing. But also a reduction in energy consumption with the variation of engine speeds as well as the optimization of heat losses. The CHALON MEGARD flexibility is also the optimization of your existing production lines with the addition of independent modules allowing a greater automation of your processes. Your investment is thus limited to modules requiring modernization, while keeping the equipment suitable for your production process. Continuous process improvement, with the aim of increasing the speed and productivity of our equipment. Improvement of hygiene, in order to adapt our equipment to standards, and to offer you production lines with maximum hygiene. Reduction of energy consumption, by reducing electricity consumption of production lines (installation of variators on motors for example) as well as water consumption by improving equipment washability (optimized design for cleaning) and improved line programming. Improved workstation ergonomics: we think about your safety, but also your health. Reducing the difficulty of the work means making your job easier, working in the best conditions, and thus improving productivity and quality. The mechanization of the lines makes it possible to reduce the repetitiveness of the movements, not to carry any more heavy loads, and requires only the cheese makers to supervise the line. Advice is central to our work. We use our know-how to advise you. We offer you the best adapted production lines for your projects, according to your quantities/rates, your infrastructures, your specifications. Our tailor-made lines are modular, flexible and scalable in order to meet your expectations today and achieve your objectives tomorrow. We optimize your existing lines, in particular by adding modules, mechanizing your lines, increasing production / throughput, etc. A team of highly qualified engineers, specialized in all areas of the cheese dairy, will work with you to define your needs and accompany you throughout the project until start-up. 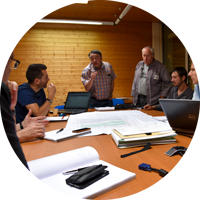 Our sales and pre-project teams work together to offer you the solution corresponding to your needs and requirements according to the specificities of your production and the evolution you wish in the years to come. 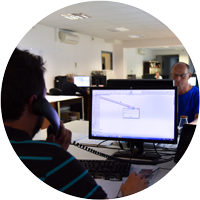 Our design office ensures the feasibility of your project and adapts the production lines according to your expectations and your infrastructures. We have engineer for the pipe realization and for the instrumentation of your future project. Defines your needs and selects the appropriate manufacturing methods. 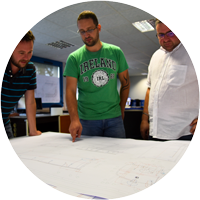 Your equipment is manufactured in our workshop allowing the control of the manufacturing and a perfect control of the deadlines. 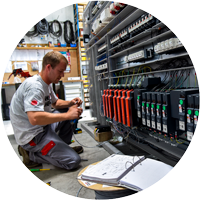 We develop and manufacture electrical cabinets and program process and mechanical assemblies. We integrate the supervision of highly mechanized lines with dynamic visualization modules, recipe management, maintenance diagnosis and production balance. 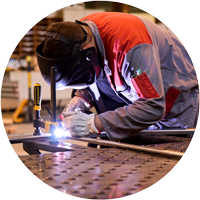 We carry out the final assembly of your equipment in our workshop in order to carry out all mechanical, hydraulic and automatic function tests before shipment. 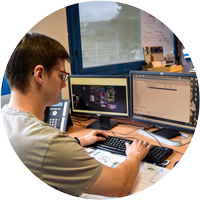 We have an assembly team working throughout the world to produce turnkey assemblies with a commitment to performance and for the mechanical and automatic maintenance of your installations. For remote control and troubleshooting, as well as carrying out a global and specific audit per equipment. Our experts provide your mechanical and automation training. They also take care of the maintenance of your installations. We have a stock of spare parts for a better reactivity, and carry out the machining of the parts internally.